Turmeric, the household spice, contains a major colouring pigment known as curcumin, together with other colouring agents (i.e. curcuminoids). Curcumin is known to exhibit potential antioxidant activity with therapeutic potential as anti-cancer, anti-inflammatory, anti-arthritic, anti-diabetic agent and also possesses liver-protective, neuroprotective (e.g. Alzheimer’s disease) and antidepressant activities. Several studies claim that after oral administration, curcumin metabolizes into several components. However, despite curcumin’s metabolism, subsequent retention of its bioactivity led to the speculation that curcumin metabolites might be responsible in maintaining the beneficial role of curcumin. Thus, it is becoming crucial to evaluate the biological functions of curcumin metabolites for understanding the mechanism of action of curcumin more precisely. Scheme 1. Synthesis of curcumin monoglucuronide and curcumin diglucuronide. Free radicals are reactive molecules generated when oxygen in the body interacts with other molecules. Although certain innate mechanism requires free radicals to keep us healthy, unsuppressed free radicals are harmful to our health. They are involved in damaging the healthy cellular DNA and thus, originate the progression of life-threatening diseases. Antioxidants are the molecules that neutralize free radicals and protect us from diseases. Curcumin glucuronides are the major phase II metabolites of curcumin produced in the body after its oral ingestion. Bioactivity of curcumin glucuronides has not been studied earlier due to unavailability of substantial quantity of these molecules. In the year 2014, two groups synthesized curcumin monoglucuronide and curcumin diglucuronide, enzymatically and chemically. Their effect on certain human cancer cell lines was also studied and it turned out that the curcumin glucuronides are poor bioactive molecules compared to curcumin. However, antioxidant potential of curcumin glucuronides has not been studied before. We synthesized and studied the antioxidant capacity of curcumin metabolites, namely, curcumin monoglucuronide, curcumin diglucuronide (Scheme 1) in comparison to the activity of curcumin. 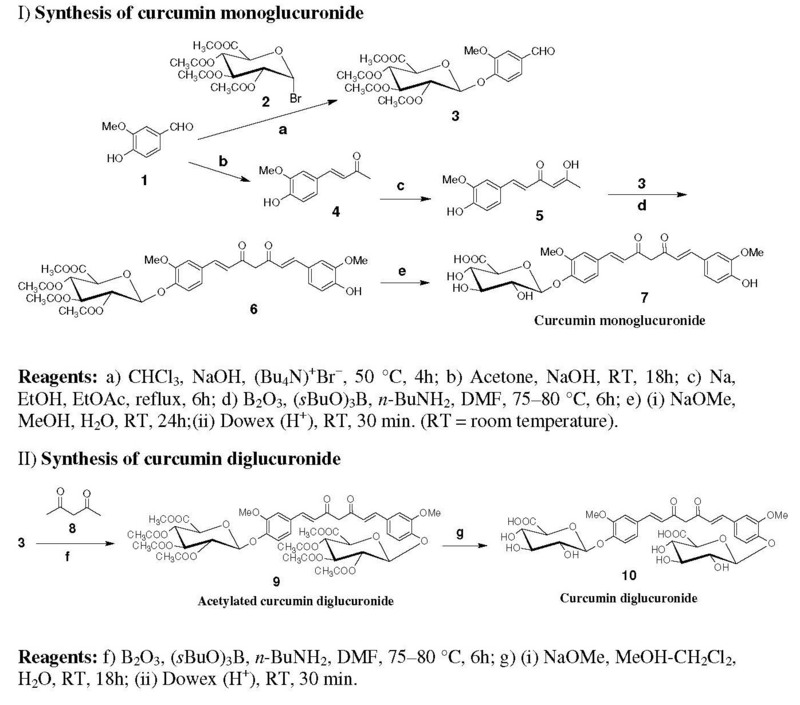 We developed a viable synthetic strategy to synthesize gram quantity of curcumin monoglucouronide (Scheme 1) and described experimental details of the synthesis of acetylated curcumin diglucouronide and curcumin diglucouronide in the literature for the first time. The antioxidant capacity was measured by following two recognized methods: i) 1,1-Diphenyl-2-picryl hydrazyl (DPPH) and ii) Oxygen Radical Absorbance Capacity (ORAC). Fig. 1. 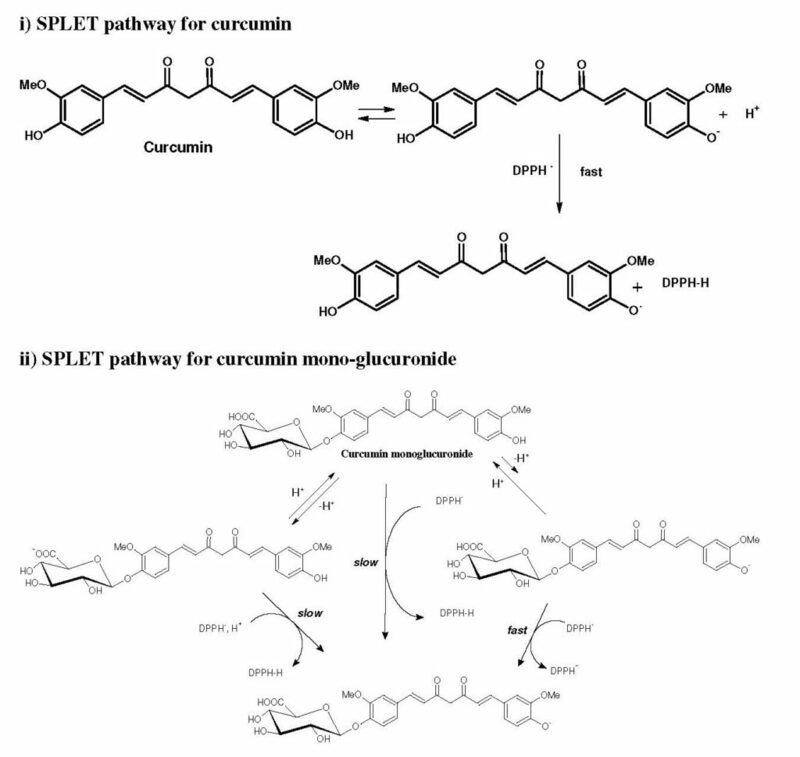 Possible sequential proton loss electron transfer (SPLET) pathway of curcumin and curcumin monoglucuronide. Our study, clearly demonstrated that in DPPH method, the antioxidant potential of curcumin monoglucuronide (SC50 = 15.61 microgram/millilitre) was almost 10-fold less, whereas curcumin diglucuronide (29.77% inhibition at concentration 333 microgram/millilitre) was not at all comparable with respect to antioxidant activity of curcumin (SC50 = 1.58 microgram/millilitre) (where, SC50 is the concentration at which 50% scavenging of DPPH was obtained). These observations indicated that antioxidant activity of curcumin possibly follows the sequential proton loss electron transfer (SPLET) mechanism rather than hydrogen atom transfer (HAT) pathway. In polar solvents (DMSO was used in our study), curcumin gets dissociated to anion in equilibrium and then transfers an electron to DPPH, and hence follows SPLET mechanism (Figure-1). Curcumin monoglucuronide in which one phenolic hydroxyl group of curcumin was protected by glucuronic acid moiety; has one -COOH group and one phenolic -OH group. The presence of -COOH group in monoglucuronide with acidity ~105 times higher than the phenolic –OH, reduced the formation of phenoxide anion in equilibrium, and thereby diminished the chances of transferring electron to DPPH and subsequently declined its radical scavenging activity (Fig. 1). Similarly, curcumin diglucuronide, where both phenolic hydroxyl groups of curcumin were protected by glucuronic acid moieties; is having two -COOH groups in its structure, exhibited almost negligible potency as radical scavenger. Similar results were observed with ORAC method as well. In summary, curcumin glucuronide metabolites, curcumin monoglucuronide and curcumin diglucuronide, do not preserve the antioxidant activity of curcumin; rather, curcumin’s other metabolites, notably reductive metabolite—tetrahydrocurcumin, might play crucial role in delivering the bioactivity of curcumin, including antioxidant activity. Synthesis and Evaluation of the Anti-Oxidant Capacity of Curcumin Glucuronides, the Major Curcumin Metabolites.